All additional resources needed e.g. activity sheets, films, songs, online games. (All you need to provide is some basic equipment such as writing equipment or art materials). Links to the PSHE Association Programmes Programmes of Study learning opportunities, covering the requirements recommended in their planning toolkit. 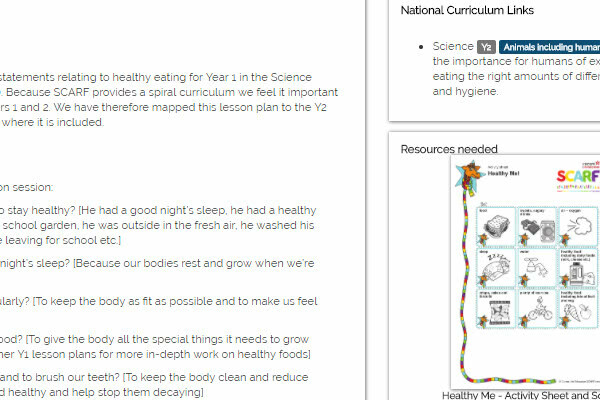 Links to different National curriculum subjects addressed in the lesson, helping you to see how you can cover many requirements of the curriculum – from Science and English through to Computing and even History – through SCARF lessons. *Before beginning, read our comprehensive guidance for creating a safe learning environment - essential for teaching about sensitive issues safely and confidently.